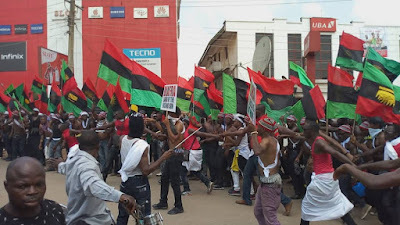 BREAKING NEWS: IPOB VOLUNTEERS STORMS MAJOR CITIES OF BIAFRA LAND CHANTING "NO REFERENDUM, NO ELECTION"
Reports reaching the news room of Family Writers Press has it that the fearless IPOB volunteers stormed major cities of Biafra land with a protest march and were chanting "NO REFERENDUM, NO ELECTION IN BIAFRA". According to the family writers correspondents who witnessed the events; the rallies is reaffirm in stance of the people of Biafra that there will no election in entirety of Biafra land come 2019 general election of the occupational government of Nigeria. 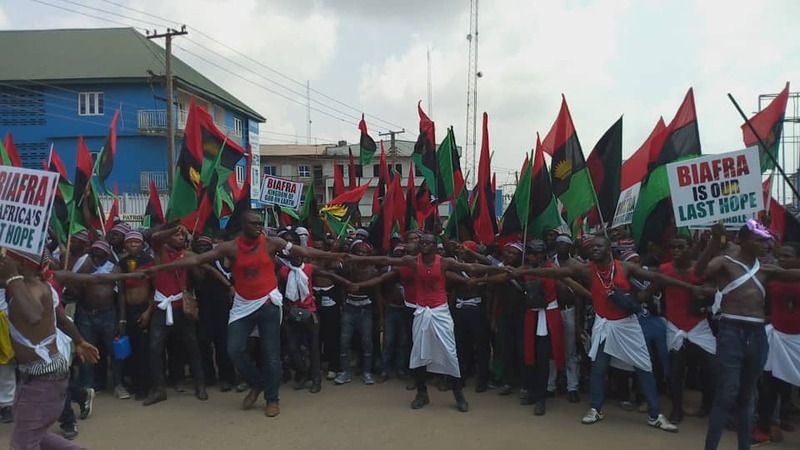 According the report reaching family writers press, the IPOB gallant volunteers matched in the those cities including Aba, Owerri, Enugu, Abakaliki, Asaba, Port Harcourt and Onitsha with Biafran flags and placards and telling the people in those cities that nobody should participate in the 2019 general elections. 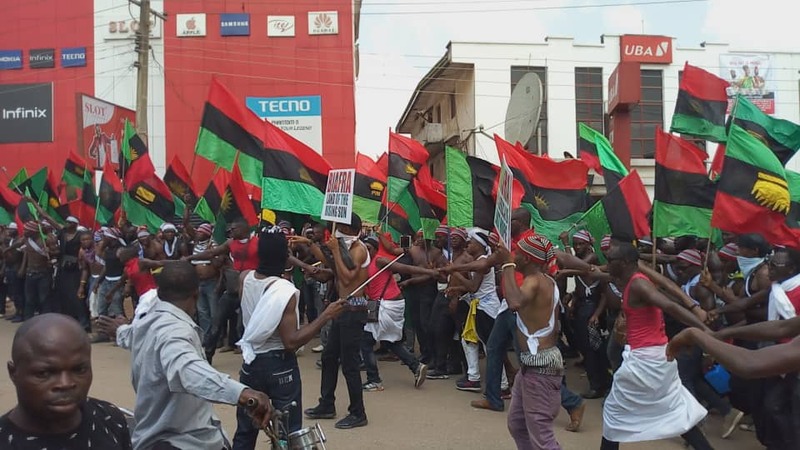 ENUGU - According to Family Writers Press correspondent in Enugu, Mazi Egwuatu Chukz, there was an intimidating numbers of IPOB volunteers who turned up for the rally in streets of Enugu. The volunteers shared handbills to the people of Enugu and assured them that if they completely boycott the election come next, that will pave way for ultimate Biafra independence because the world will be forced to break silence over Biafra agitation. ASABA - Family Writers Press correspondents in the city, Chibest Chukwu and Sunibest Okafor reported that was a successful rally in Asaba urging the people of Biafra to boycott any election organized by Nigeria occupational government until Biafra referendum is conducted. According to our correspondents who witnessed the event, the residents of Asaba assured IPOB volunteers that they are not going to participate in any election organized by Nigeria occupational government unless they respect the wish of Asaba people which Biafra referendum. ABAKALIKI - Our correspondent in Abakaliki, Ogeh Friday Igiri reported that there was a successful rally conducted by IPOB volunteers which took off from the sperando filling Station in Abakaliki city down to Afikpo Expressway and ended it up in Meat Market in Nkwo Agu near Abakaliki military cantonment. During the rally, the report revealed that the IPOB volunteers sensitized the people of Abakaliki on the need for 100% boycott of elections next year which will give signal to the world that the people are no more interested in Nigeria but Biafra Independence. Responding, the crowd who trooped out to watch the volunteers' parade in Nkwo-Agu vicinity chanted "All Hail Biafra! All Hail Biafra!! All Hail Biafra!!!. They went ahead to assure the commander of the IPOB volunteers that none of them will have anything to do with Nigerian election because they have voted for too long without result. ABA - Our correspondent in Aba, Ezinne Orji and other IPOB journalists like Onyechere Ugochinyere reported that there are u huge as they IPOB volunteers paraded around the city of Aba and sensitize the people of Aba on the need to stay away from any election organized by Nigeria occupational government. The people who witnessed the event in Aba assured the IPOB volunteers that the issue of elections boycott is a done deal as none of them is ready to participate in Nigeria elections any more. According to the report filed to the news men by Onyechere Ugochinyere of Umuchiukwu Writers, there was serious tension as at the time of filling the report, as Nigerian military forces have taken over School Road market near Enyimba Stadium Aba province of Biafra land, because that was where the protest by IPOB volunteers in Aba ended. She made it clear that no casualty was recorded yet as at the time of filling this report, the Nigerian military men are still parading round the market and street, harassing any civilians putting on black and red which was the dress code for the rallied IPOB volunteers. More information will be coming your way as we get more reports concerning the rallies in other cities of Biafra Land. Courtesy of Family Writers Press correspondents.